This chicken vegetable soup is a great tasting, simple to make, and full of nutrients from natural herbs, spices, and vegetables. Protein packed, flavorful, and perfect for a cold day! 1. Cube chicken breast and place in large bowl. 3. Place soup pot on Med high heat, add olive oil, thyme, bell pepper, minced garlic, onions, and scallions. 4. Add chicken breast to pot. Let brown, then add chicken broth. 5. Bring to boil and add chopped carrots and potatoes. 6. Set heat to simmer place whole uncut habanero pepper a float on top of soup. Cover pot and cook for 45 mins. 7. **To save nutritional value of the kale, we don’t like to add the kale to the pot while cooking. 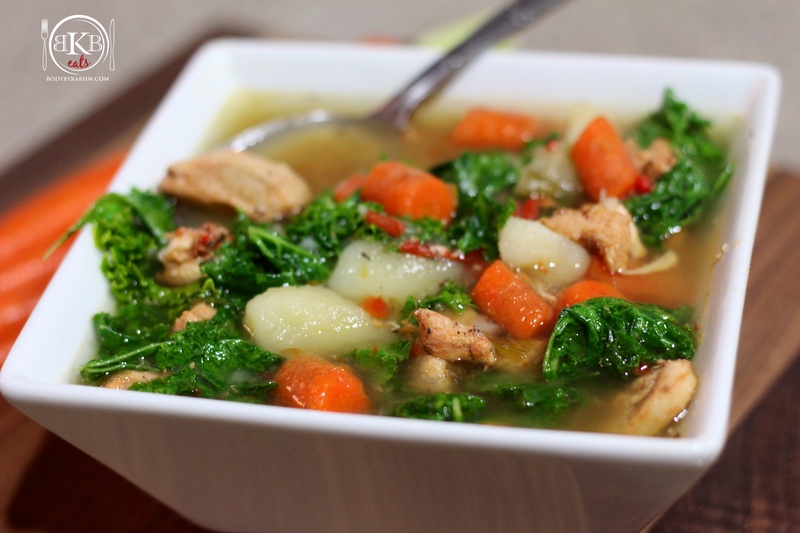 Add the kale to your individual bowls of soup. Lightly stir in so that the kale is covered in broth. The kale will soften just right. I’m signing off now. I need to start on this soup for dinner. Winter, 2015 flue and cold season and back to the soup. All my veggies pre cut and pre washed but organic.